In a ΔABC, if ∠A = 55°, ∠B = 40°, Find ∠C. ∠B = 55°, ∠B = 40°, then ∠C = ? If the angles of a triangle are in the ratio 1: 2: 3, determine three angles. The angles of a triangle are (x − 40°),(x − 20°) and (12x − 10°). Find the value of x. The angles of a triangle are arranged in ascending order of magnitude. If the difference between two consecutive angles is 10°, find the three angles. As the difference between two consecutive angles is 10°, the three angles are 50°, 60°, 70°. Two angles of a triangle are equal and the third angle is greater than each of those angles by 30°. Determine all the angles of the triangle. Two angles of a triangle are equal and the third angle is greater than each of those angles by 30°. Therefore, the three angles are 50°, 50°, 80°. If one angle of a triangle is equal to the sum of the other two, show that the triangle is a right angle triangle. Therefore, ABC is a right angled triangle. 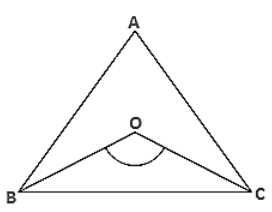 ABC is a triangle in which ∠A = 720°, the internal bisectors of angles B and C meet in O. Find the magnitude of ∠BOC. 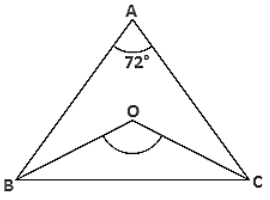 ABC is a triangle where ∠A = 72° and the internal bisector of angles B and C meeting O. The bisectors of base angles of a triangle cannot enclose a right angle in any case. Therefore, the bisectors of a base angle cannot enclosure right angle. 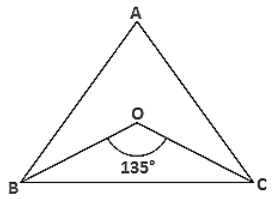 If the bisectors of the base angles of a triangle enclose an angle of 135°, prove that the triangle is a right angle. Therefore, ΔABC is a right angle triangle that is right angled at A. 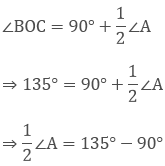 In a ΔABC, ∠ABC = ∠ACB and the bisectors of ∠ABC and ∠ACB intersect at O such that ∠BOC = 120°. Show that ∠A = ∠B = ∠C = 60°. (iv) All angles more than 60°? (v) All angles less than 60°? (vi) All angles equal to 60°? Justify your answer in each case. (ii) No, A triangle can't have 2 obtuse angles. Obtuse angle means more than 90° So that the sum of the two sides will exceed 180° which is not possible. 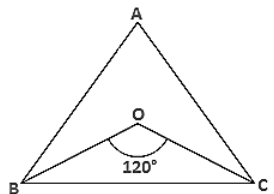 As the sum of all three angles of a triangle is 180°. (iii) Yes, A triangle can have 2 acute angles. Acute angle means less the 90° angle. If each angle of a triangle is less than the sum of the other two, show that the triangle is acute angled. Hence, the triangles are acute angled.